In 1927 Katherine Susannah Prichard, then living in Greenmount, outside Perth WA, ventured north by train and truck to stay with “a friend whose husband owned a cattle station”. And right there is the genesis of two related projects I’ve had in mind for some time. One is to travel along and photograph what remains of the old Northern Railway and the other is to document, and follow the travels of, in my trusty ute, a remarkable confluence of Independent Women in the Pilbara region of Western Australia in the first half of the C20th. 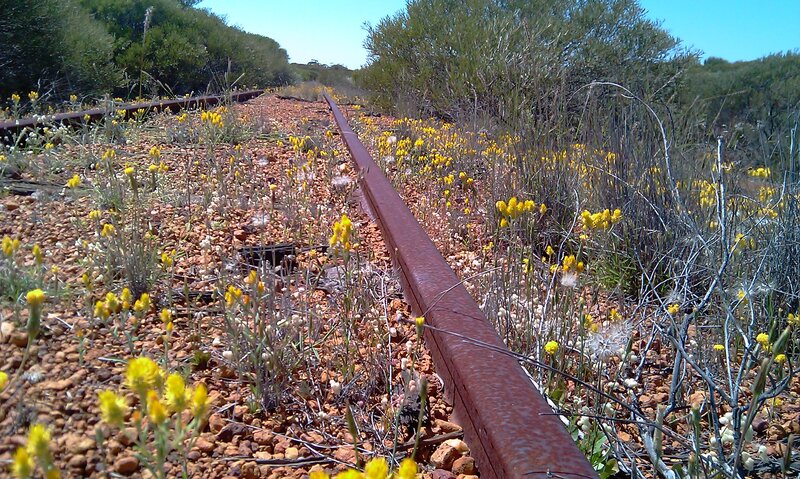 Commenced in 1890, the Northern Railway connected Geraldton on the west coast (400 km north of Perth) with the Murchison goldfields towns of Mt Magnet, Cue, Meekatharra and Wiluna. From Perth travellers could access the line via the Midland Line from Guildford to Geraldton or via the northern wheatbelt line from Northam, 100 km inland of Perth on the Kalgoorlie line, to Mullewa 100 km inland of Geraldton on the Northern Line. The women of my ‘confluence’ are Daisy Bates; Molly, Daisy and Gracie, of the Martu people and the heroines of Follow the Rabbit-Proof Fence; Ernestine Hill and KSP. The region they all variously lived in or passed through is centred on present-day Newman (built commencing in 1968 to service BHP’s iron ore mines), on the headwaters of the Fortescue River, and on the Tropic of Capricorn, about 1200 km north of Perth and about 300 km of still largely impassable country inland. These days Newman is the next town after Meekatharra on the Great Northern Highway and they are separated by 420 km of fairly bleak desert, gibber plains, acacia scrub and occasional ghost gum-lined creek crossings. So “four hundred miles” (640 km) from Meekatharra would have put KSP well north of Newman and just a bit north of Roy Hill Station (120 km north of Newman) where Daisy Bates’ husband, Jack was an overseer in the late 1890s. But in fact Turee is south west of Newman, about 120 km, and so only 300 km, or less than 200 miles, north of Meekatharra. One guess I have is that KSP actually went by train to the end of the wheatbelt line at Mullewa and then went north by truck along the network of rough tracks servicing the stations of the Murchison known as the Woolwagon Pathway. The distance would be (roughly) right and further evidence is that when she left Turee she went on to Onslow, a port town which marks the northern end of the Woolwagon Pathway. Daisy Bates (b.1859) joined her husband and 13yo son Arnold in Perth in 1899 after leaving them in NSW and spending five years away in England. Jack’s boss at Roy Hill had offered him support in taking up a neighbouring lease, 180,000 acres at Ethel Creek. Daisy was keen and apparently had the money. The following year she went by ship to Cossack (1,500 km north of Perth) where Jack met her with a horse and buggy. In her own account she says, “I then traversed in my buggy eight hundred miles of country, taking six months to accomplish it.” (Notice the ‘I’, she pretty well ignores Jack as much in her writings as she did in life). During that time they went out to Roy Hill, probably following the mostly dry course of the Fortescue River upstream past the wonderfully rugged Karajini Ranges, took a look at Ethel Creek and then returned to the coast at Carnarvon, probably dropping south (passing by Turee Creek) to follow the course of the Gascoyne River, 400 km entirely cross-country then of course and still only dirt tracks today. Daisy purchased Ethel Creek and renamed it Glen Carrick “in affectionate remembrance of a dear friend in England” (she probably didn’t tell Jack that she had represented to Carrick that she was a widow and had considered marrying him). In her story Three Thousand Miles in a Side-Saddle she tells how she purchased 770 head of cattle near Broome and drove them south 1,000 km intending to rest them at Ethel Creek, and then, leaving 200 to form the basis of a herd, drive the remainder south to sell into the Perth market. Unfortunately there was a stampede when the cattle smelled water at Roy Hill and so many were lost that all remaining had to be sold to cover her costs. After a short while at Glen Carrick she hitched a lift back to Port Hedland and her ambitions of being a grazier were at an end. Daisy came north one more time, in 1910-11, as part of the Cambridge University Expedition of A.R. Radcliffe-Brown to study Aborigines at Sandstone in the Murchison (on a branch line out from Mt Magnet) and on the Dorre and Bernier Islands in Shark Bay out from Carnarvon where the government had made an ill fated and short lived attempt to isolate ‘diseased natives’. By this time Daisy Bates was a well known and experienced chronicler of Aboriginal languages and customs but she didn’t get on with Radcliffe-Brown and he treated her as an amateur specimen collector and later stole her work which she was constantly struggling to collect into publishable form. 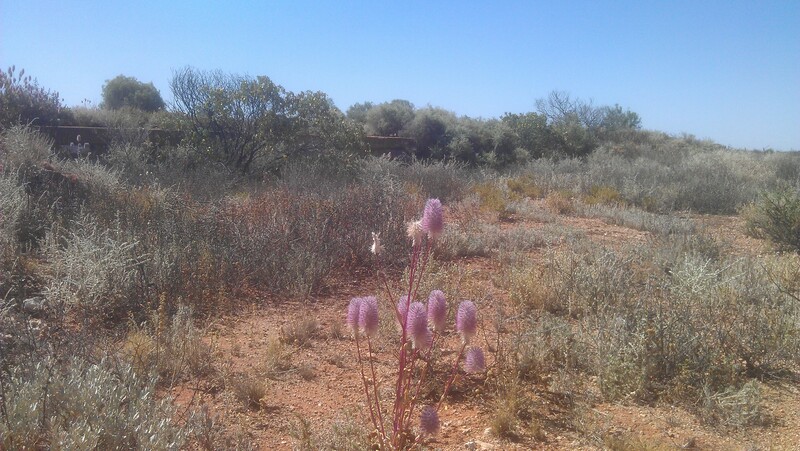 On parting from the Expedition, she writes, “I turned my footsteps to the head of the Ashburton, Gascoyne, Murchison and Fortescue Rivers, once a great highway of aboriginal trafficking”. But what she means by this I am not sure. Since the movie, Rabbit-Proof Fence (2002), the story of Molly, Dasiy and Gracie is well known. The girls were of the Martu people and lived at Jigalong, near Ethel Creek, so it is possible Daisy Bates studied their grandmothers. The Martu Native Title area extends north and east into the desert from Jigalong and so far south that Daisy Bates said the language of the people at Ooldea, on the other side of the Nularbor, had some of the same elements. Although the Martu claim does not extend as far west as Turee Creek, KSP’s Coonardoo also, apparently, speaks a Martu language. The story of the movie and of Doris Pilkington’s (Molly’s daughter) book is of the girls’ 1200 km walk back to Jigalong in 1931 after escaping from detention at Moore River (100 km north of Perth). Of course the highlight of the movie for me was Gracie catching the train at Meekatharra to join her mother in Wiluna. Ernestine Hill (1899-1972) was a freelance journalist and single mother (her son, Robert’s, father was rumoured to be her boss at Smith’s Weekly, R.C Packer, Kerry Packer’s grandfather). The Great Australian Loneliness (1937) is her account of the journey she undertook around northern and central Australia in 1930-32 and the people she met. Her son, who would have been 6 or 7 years old, did not accompany her and is not mentioned. She set out from Hamelin Pool on Shark Bay, hitching lifts with station owners, mail trucks and coastal cargo vessels up the west coast, detouring at one point down from Port Hedland to Marble Bar and then further south past Roy Hill to Jigalong specifically to meet Molly and Daisy (which implies that their escape had been written up in the newspapers). Hill continues on into the NT, then returns via Perth to South Australia where she meets Daisy Bates, now ensconced at Ooldea, and with whom she later collaborates in the writing of The Passing of the Aborigines (1938). Finally, she heads back north via Coober Pedy and finishes by riding a camel into Alice Springs. Interestingly, although she doesn’t mention her, Robyn Davidson (1950 – ) in the journey by camel which is the subject of Tracks (1980) appears to mirror Hill, starting at Alice Springs and finishing at Shark Bay, seeking solitude in the desert where Hill sought ‘colour’, but like Hill, Davidson has an intense interest in and regard for the Aboriginal people.